I also don't really understand why you have the box in the hive and what it consists of in terms of comb and support. If it is just a shook swarm, ie bees and a queen with no comb then you should have just tipped it into your hive on the evening you got it. Leaving it in the box will cause them to start building comb in there which then makes things more complicated. The box is clearly not large enough to contain national frames, so it can't be a nuc. The only other alternative is a queen mating box and I doubt that will be the case. 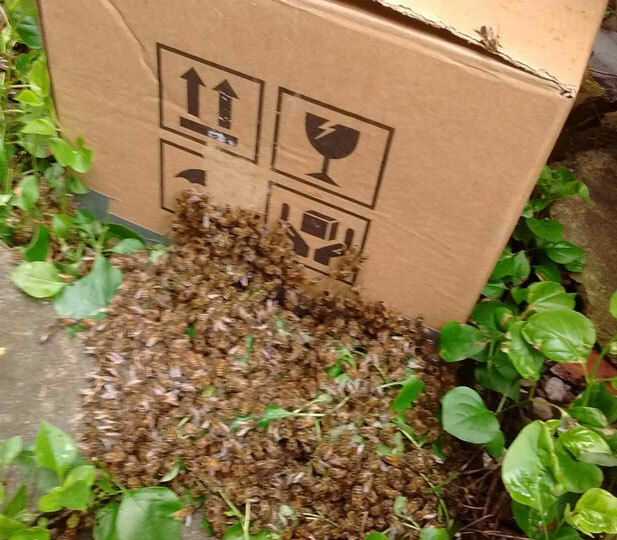 If there is no comb support, just a box with bees in, then you want to treat them like a swarm and get them building off your top bars straight away. The only difference is that you will need to feed them, which obviously you have in hand. Sorry if I have misunderstood something, but I can't see what keeping them in the box inside the hive is achieving. The bees had already started building comb in the poly box, I was not aware of that until I took off the lid which also had a tiny bit of comb attached to it. Maybe that explains why the beekeeper who gave them to me told me to put the opened box into my hive and hopefully they would start building from the top bars of my hive. I can only guess that at some time they will outgrow the poly box which will then be removed. Regarding the feeder, mine was only meant to be a short term solution and I will have another think, I based it on the circular plastic type with a circular cone shaped central feeding station which the bees climb down to sup the syrup. Please continue to point me in the right direction and prevent me making life hard for the Bees. I'm afraid you are not being kind to the bees leaving them in the box even with the lid off and setting yourself up for real problems. Bees much prefer to build comb down wards than upwards. Also, in order to keep the brood warm they need to have a ceiling above them to contain the heat they produce. This is why they start at the top of a cavity and work downwards. They already started at the top of their cavity.... the poly box lid.... but now you took the ceiling off. They will not abandon the brood they have in the box voluntarily, so you will need to cut it out and fasten it to the top bars. There was a recent post about cutting a colony out of a wheelie bin which has a good photo of how to attach the comb to bars. Better deal with it sooner than later as the problem will only get bigger. Feeling down at present.......little family did not survive. Earlier in the month I had a visit from Beewrangler while he was in the UK and he could not find the marked Queen. The number of bees have dwindled ever since. So it's back to the begining for me. They must be from my mate Doug because he said I'm the next on the local swarm list. Will find out tomorrow............Tidy. 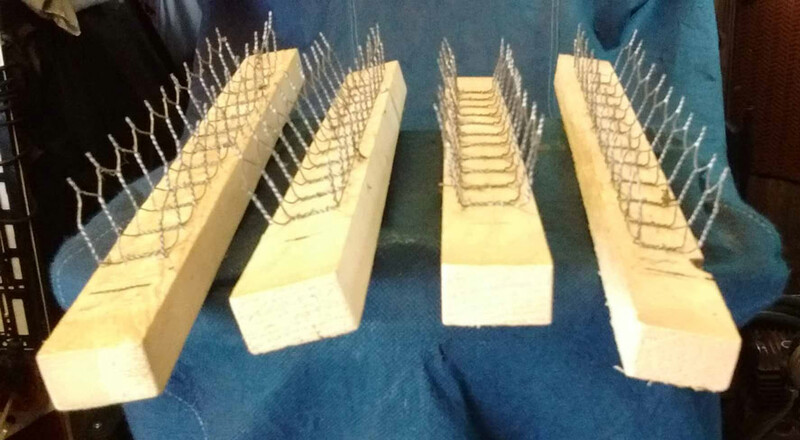 The top box with National frames has a triving nucleus which will be chopped and cropped and supported with chicken wire stapled to the top bars of the hTBH. Doug will be helping me with this. Appart from having bees in the lower box, that at present is all I know. Both boxes have bees coming and going, plenty pollen going in the top one. May I just chip-in about comb guides? In our BKA Apiary TBH we tried three of three versions with a swarm intro, waxed groove, waxed fillet and 25mm foundation in a groove and the bees have shown absolutely no preference whatsoever. Maybe they're just not fussy bees. My waiting hive has waxed triandular profile in at present, roll on Monday or Tuesday, Doug said let them get used to their new surroundings, which they seem to have mastered well. PS Don't give up like I did Ollie, something will come your way. Thanks BB. One thing I never do..'give up' try , try and try again. Weather here is disastrous. wet wet and also been cool too. Had my turf ( fuel for the range incase people don't know what turf is ) delivered Thursday so had to spend time getting that stacked up yesterday, morning started out misty foggy drizzle, by 10 sunshine, I got on with the turf and in a break, had a check on my bees, busy , so I planned on an inspection later as the temp was up too ( I haven't been able to get into the hives for 4 weeks now due to the weather), by 3pm RAIN RAIN RAIN . Ireland is a wonderful country but the b****y weather! The bees in my hive have been there since July 2016, they have occupied one half of it up to a follower board, and I decided to let them do their thing and not remove any honey this year, next year we will see. They have been undisturbed for the winter months for some time now but have remained busy until the air temperatures started to drop below 10C. Some days if the sun gets on the hive some brave souls venture out. When they were first installed I fed them with syrup until mid September and over the winter months when it gets even colder I am going to give them some fondant. I like other peeps method of using a follower board and spreading fondant on to it as I don’t have a top bar with old rigid comb to use. So what can I attach to the F/board that fondant can be spread on to? I’ve seen photos but not been able to search/find any suitable plastic or polypropylene products. Any suggestions, should I avoid metal items? Also I’ve not given up on the glass sided hive I have some double glazed panes for. Put fondant in a clear freezer bag. Roll flat with kitchen roller. Attach to side of follower board using two-3 vertical strips of flexible plastic/varnished card. Slash a few access holes in bag..
Or cut a 1 liter plastic milk bottle in two cutting down the middle of each vertical side. Insert fondant. Flatten to height of side. Replace other side so fondant is flush with both sides. Cut holes in side of bottle. pin to follower board. (or use a tetra pack milk/juice bottle - easier to cut. Had a look in yesterday for the first time since last September to remove the empty fondant tray and bag. Only removed the follower board. Thinking that because they have come from a National hive that they have been spoiled and don't know how to build straight comb because the first two bars have crossed. 1st bar has about three inches of comb mid-bar and the frame behind it is full width catenery but curved around the small comb on the 1st frame and attached to the bar either side of it, Bees on both. I'm expecting to find the same throughought the hive, so undecided as to whether leave it a bit and sort out the whole hive when temperatures become more stable or leave them to it. Only in it for the Bees. I've put a empty used national nuc' box on the compost bin almoust beneath it. Undecided what to to with them. Should I put them in my half used hTBH? If so would it be best to turn it round so that the holes in the sides at each end and currently bunged can be used and the center holes closed? Congrats on your swarm. It is a wonderful sight isn't it. I hope they hang around long enough for you to capture them. I would not recommend putting a prime swarm in the other end of your occupied hive unless it is from your own hive and you can create a no mans/bees land area in the middle between each end using a couple of followers and at least a couple of blank top bars. You would probably be better putting the prime swarm into a new hive though or a temporary swarm/bait box until you can build/source another hive. They may not settle in the same hive as the parent colony especially if the follower boards are not bee tight....as mine never are! If you do put them in the other end of your hive, it should only be as a temporary measure because they will expand quite rapidly and you will have no room to manoeuvre and trying to do an inspection will become impossible. So look at 4-6 week max timescale to get them moved out, and of course you will need to be very careful when you do come to move them because the comb will be soft and fragile and at risk of collapse and the bees will be orientated to that location, so will need to be re-orientated to a new location. 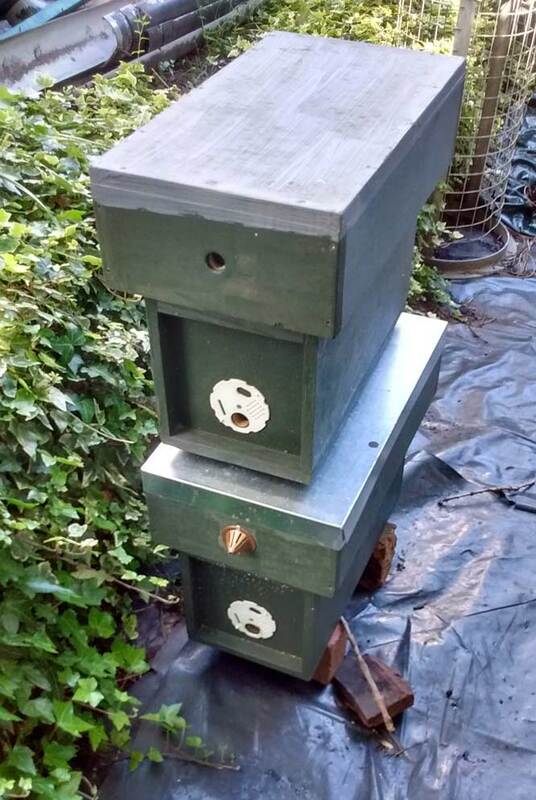 A square plastic planter with a hole cut in the side and top bars across it and a piece of plywood on top to keep the rain out and large drainage holes cut in the feet for condensation to run out, should buy you a few weeks to build a hive if you don't have one ready. Whatever you go for, good luck with it and let us know how it goes. You will probably guess my helper is an out and out National Beekeeper, its his bait box and the photo was before the were installed. There are still a lot of bees in my hive so not 100% sure the swarm is mine and I have just extended the top bars again so it's now 75% full. My followers are not bee tight either. I'm happy just giving bees a home and don't really have room for another hive so as wifey would like some honey I'm swapping the swarm for some jars of the precious off matey. Maybe I will harvest some from my hive in the future. BTW matey says today he has captured two swarms today, mine and another earlier in the day, first ones around Quarry Bank this year. 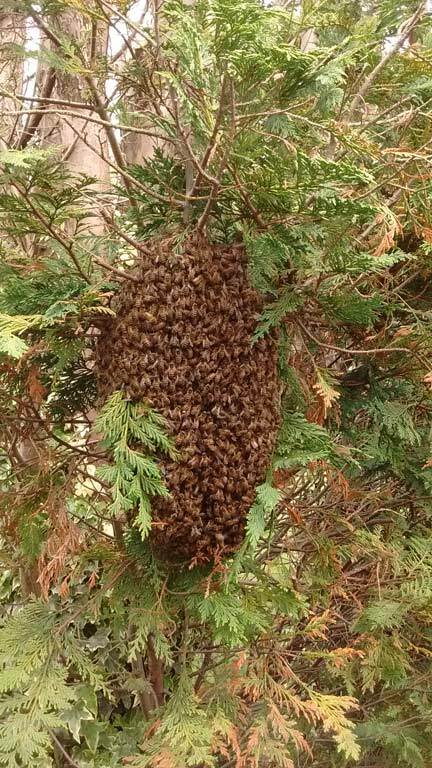 Another swarm, this time I saw them making for the camper shortly after backing it up after working on it. Doug reckons just a small one, about five thousand this time plus a few more on a rear light unit above. Will be boxed in the morning. I've now bought PC's Managing the Top Bar Hive book and should now have a better idea about what I need for a balanced hive. Almost perfect timing... 11 days after the prime swarm... and what a convenient place to collect them from. You may well get another one or two more casts in the next few days depending on the strength of the parent hive. I'm expecting my first cast swarm Monday or Tues. Looks like they might get wet unless they follow the precedent set by the prime swarms so far and swarm straight into an empty hive! I'm just about to head out to see if I can hear the queens piping in my hives that have swarmed, now that it's quiet out there. 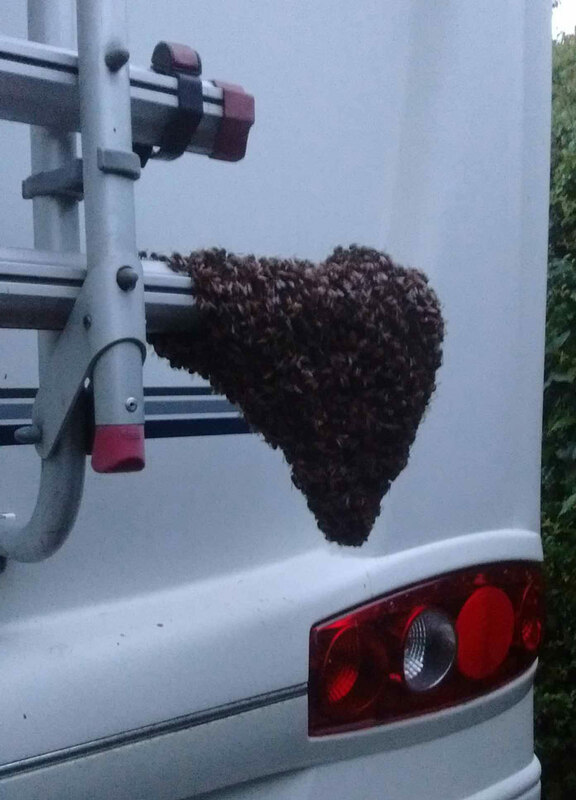 There was activity behind the camper again this morning and when I had a look there were a few hundered bees around the high up rear lights. Here we go again I thought but to my suprise directly below them on the floor were a mass swarm amongst the broken slabs and lilac suckers. In case I had another swarm I had made up a bait box out of a cardboard box with a hole and a waterproof lid as a make shift home with lemon grass oil and beeswax scented interior ready but they had ignored that and made for the camper. Anyway this evening it started to rain so I gathered as many as I could and put them in the box which I had placed on the ground next to the bees I couldn't get from between the slabs. Last time I looked they had extracted themselves from the ground and were going in the box so I think I have saved the Queen. It's just started pouring with rain and If I had left them they would have been washed away. Doug is coming in the morning, another family to find a home for. Hard work this bee homing. Some time after the third swarm I reduced the number of bars in the hive after using the managment section in PH's book. It was almost full. I only removed empty comb and a few bars with just a little capped honey near the top. There were plenty of full bars of honey but obviously not so many bees after three swarms. I was careful to make sure the few bees that came out on the removed bars were put back in the hive. I must say the honey in the couple of small jars I processed was jummy. However after being away for most of June and all of July, observing the hive on returning home it was apparent that all was not well, although a few bees could be seen entering the hive, they were not inputting pollen. So I guess they were robbing it and on checking there were only a few bees and enptied combs. Anyway all is not lost. I was disappointed in only homing the bees for one year and thought about packing it in, but the three swarms I raised have gone to good homes and are reported to be doing well. Also Doug cheered me up by saying a hive he started and is no longer wanted, I can have when he collects it later on and next spring leave them in the vertical hive or tansfer to my horizontal. There were not a lot of swarms reported near me in 2018 but I'm on the local Swarm wanted list and hopefully more swarms will be produced this year. Anyway I have a cunning plan and welcome any input. I'm going to reduce the sections of the National to a minimum and use it as a bait hive suitably prepared and put into place before the Spring. Below is a view of where I visit almost every week of the year and have marked with red X's where there are established Apiaries outside SoAGC's boundary fence. The red A is where I thought about putting the National pointing West against the wall of an unused club outbuilding overlooking a field. It will be in an area unused by the club and if it should attract a swarm it will be removed and the family transferred to my hTBH at home.